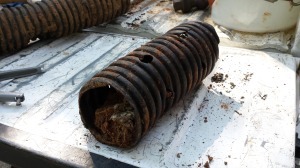 A client recently hired us to determine what was wrong with his existing septic system in Springfield, MO. There was sewage seeping up in his yard from the lateral lines and sewage backing up into the house. He was in need of a lateral line repair for his septic system. He has owned and lived on the property since the fall of 2013. The original system was installed around 1977. For more information about our services visit a previous post I have on Septic Inspections for Southwest Missouri. Initially a septic inspection was performed before purchasing the property. However, that inspection did not reflect the true functionality of the septic system. The homeowner hired a second inspector to look at the system. That inspector told him the system could be fixed by installing an aeration system in the septic tank. The homeowner contracted with that septic system service in Springfield, MO to install a name brand aeration system. After months of operation the homeowner still had no improvement in the conditions of his lateral lines. That is when the homeowner requested our septic services at Envirotek Systems. After an initial consultation it was decided to further investigate the cause of his problem. 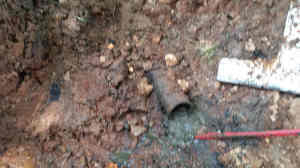 We inspected portions of his original lateral lines and discovered that four inch perforated coiled tubing had been used. (The lateral lines are the part of a septic system that carries and distributes effluent from the septic tank for disposal and further treatment into the soil). There was a minimal amount of gravel bedding around the tubing. In one area there was no bedding and the perforated tubing was completely full of clay. In some areas the tubing was partially collapsed. In Springfield, MO and Greene county 1-1/2 inch clean rock is required to be used as bedding around conventional lateral lines. The tubing was also full of sludge due to a lack of proper baffling at the septic tank and a lack of routine septic tank maintenance. The tubing was installed at the wrong elevation causing a slow percolation rate of effluent into the soil. The lateral line tubing was also sloping severely downward with no ability to evenly distribute the effluent. Additionally, the amount of laterals was inadequate. All of these factors combined was causing the soil to be overloaded with effluent. We used our proprietary methods to relieve the overloading of the sections of lateral line we had accessed. We were originally in hopes of restoring all of the original septic system. However, our investigation determined the existing system to be unworthy of a full restoration attempt. Our recommendation was to replace the existing septic system with our new engineered advanced treatment system which utilizes Visi-Pump components. In the meantime, the homeowner is enjoying some relief from backups as a result of our proprietary methods of relieving the system overload.